Looking for best water flossers for kids? Do you have trouble getting your kids to floss every night? Consider using a water flosser for kids as a way to improve the health of your child’s gums. Once your kids get the hang of a water flosser, they’ll want to use it every night without fail. All it takes is going over some basic instructions, a care guide and proper technique and your children could have healthier gums within days or weeks. The sooner you get your kids into flossing, the more likely it becomes a lifelong habit that continues into adulthood. The health and beauty industry has tons of manufacturers competing for your hard-earned money. Luckily, that means there are several models of water flossers for kids on the market that are good choices for your home. Here are five of the best water flossers for kids that you can buy. Every discussion about water flossers has to include a model from Waterpik. This company is one of the top producers of water flossers, and many consumers love the way their teeth feel after using a Waterpik device. 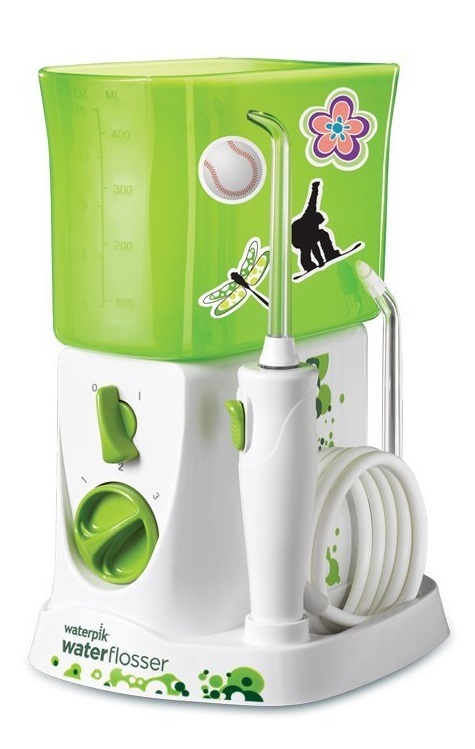 Waterpik makes a specially designed water flosser just for kids. It’s one of the top-rated products for sale in this category. It comes with a unique green color, 20 decals that your kids can use to decorate the product and simple controls. The electrical system and on/off switch is geared towards children so they have an easy time using the device. The water reservoir doubles as a cover to keep the main device clean when not in use. Just clean it out after each use and turn it over. A dial switch controls the pressure of the unit, while the on-off switch toggles back and forth. The Waterpik flosser for kids comes with an orthodontic tip to clean around braces and a regular tip for normal washing. The manufacturer says this water flosser works for kids ages 6 to 12., although younger children may find the device curious. If you have a youngster who can handle a water flosser, talk to your dentist about getting them started on flossing early. Waterpik guarantees healthier gums in just 14 days. The water flosser for kids also comes with a two-year warranty. Kingstar’s cordless water jet portable oral irrigator comes in a handy container that looks like a sports water bottle. The entire contraption fits in one hand, and it comes with a safety strap in case you lose your grip. Part of the mechanism of this water flosser for kids sits inside the water reservoir. That makes this water flosser look cool and aerodynamic at the same time. 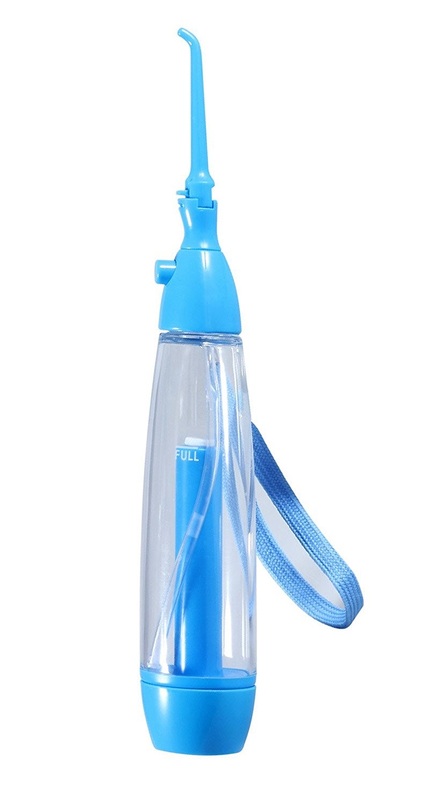 The lightweight plastic construction makes this water flosser for kids an easy purchase. If your child accidentally drops it, no big deal. The plastic bounces right back. Another good safety feature of this oral irrigator is that it runs on water pressure as opposed to electrical mechanism. Pump the button several times to built up water pressure in the reservoir and then let the fun begin. Your children have fun pumping the water and then cleaning their gums at the same time. Once the reservoir empties, fill it again for a double dose of enjoyment. Some parents may feel the lack of electricity is a detriment, but it is safer around water. This model works for children 6 years old and older, and parents should supervise its use. The one major downside to this is that it only comes with one tip instead of several in case your child gets a hold of this as a toy. The FC-10 water flosser from Wellness has everything your child needs for cleaner teeth. At 3,000 pulses per minute, this oral irrigator delivers plenty of water to clean in between teeth, behind braces and above the gum line. 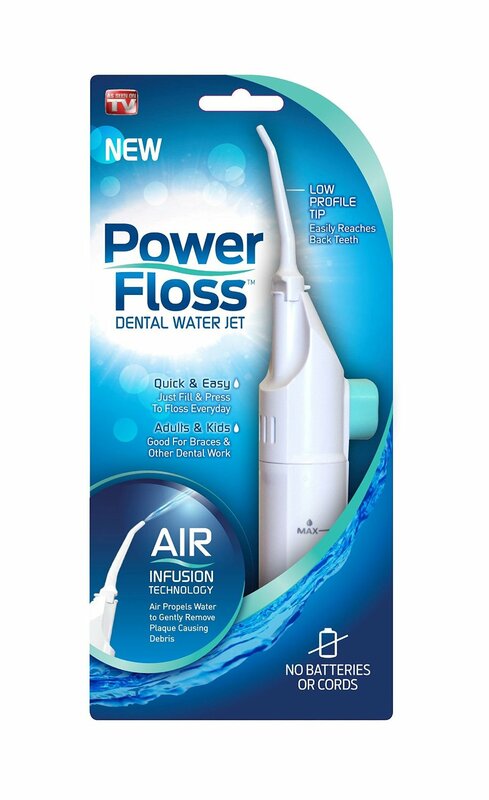 Because it uses batteries, you can take this water flosser with you to grandma’s house for the holidays. Wellness designed this oral irrigator with three modes: 3,000 pulses, 1,600 pulses or soft. If your child has sensitive teeth or gums, try it on the softest setting first before moving up to something more powerful. It’s best to ease your youngster into using a water flosser rather than having a lot of water entering the mouth all at once. Instead of having to replace batteries, the sealed design lets you recharge the device after each use. Just place it on the stand and it reaches a full charge within hours. This water flosser is great for kids who get an assist from adults until their hands get bigger. It’s easy for a grown-up to grip this oral irrigator with one hand, but it may be more difficult for kids to grip the device. Teach children to lean over the sink while holding it with two hands for best results. Otherwise, you may have water all over the floor, all over the pajamas and just a big mess in general. Nicefeel’s water flosser is a fantastic choice for children for much the same reasons as the Waterpik model. Two knobs provide easy controls on the main apparatus. A flip-top lid holds extra tips while the tips already in use store on the sides. The handle for the contraption has one big button for easy control of the flow of water. Meanwhile, the reservoir holds plenty of water to do both the upper and lower teeth without refilling it. The water supply lasts for 90 seconds or longer. Water pressure controls have 10 speed settings that go from very soft to deep cleansing. Control this setting with a large dial on the front of the water flosser. The large button on the handle is a pause button in case your child needs to stop at any time and for any reason. This water flosser for kids comes with seven tips, including an orthodontic one to clean behind braces. Other tips are for high-pressure cleaning, irrigating the tongue and for deep cleaning below the gumline. Nicefeel has a winner on its hands with a combination of practicality, functionality and child-friendly design. Even though this oral irrigator has kid-friendly choices, the entire family should use it thanks to the seven different tips that comes with the packaging. Power Floss takes a different approach to water flossing. Press the button several times to prime the water pressure, and then the water flows with a soft pressure over your child’s teeth. Your youngster gets to pump the air into the water chamber as a fun activity ahead of cleaning his teeth. Because there is no electricity involved, this water flosser is safe for kids to use compared to battery-operated or plugged-in oral irrigators. The tip reaches behind braces and orthodontic work to clear away any food and debris. Water also reaches in between teeth for a complete clean. Although the water pressure may not live up to the same standards as adult-sized water flossers, this basic unit does the job for kids. One major upside is that this oral irrigator travels wherever you go. It’s an ideal choice for Christmas visits to grandma’s house or summer vacations on the road. Take this comfort of home with you so your kids can practice good oral hygiene away from their ordinary routine. The pump button is large, which means your kids have an easy time pumping water into the device. Although it is portable, smaller children may need two hands to operate this water flosser properly. Overall, the Waterpik and Nicefeel are the two best water flossers for kids on the market, without question. Both models are reasonably priced, so you can’t go wrong with either one if you have trouble deciding between the two. Perhaps the biggest issue is whether your child’s favorite color is green or blue. Both of these manufacturers have a lot of experience designing kid-friendly water flossers, so you can’t go wrong with either one. The best part is that adults can use these water flossers as well. Avoid the two air pump water flossers unless you simply want to use these items to get your children interested in flossing. The mid-range water flosser from Wellness is a good choice for a portable option to take on the road, but you should buy this to supplement a kid-friendly water flosser on your bathroom countertop. 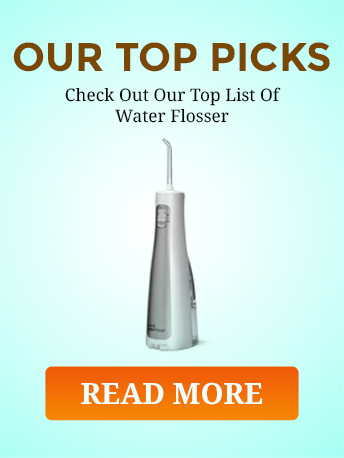 I hope my recommendations of best water flossers for kids helps you!